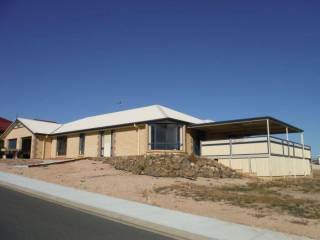 Located in the new housing estate of Moonta Bay / Port Hughes Coastal Delight is a 10 minute walk to the sandy beach and jetties of both Port Hughes and Moonta Bay. Built in 2016 and with two lounge areas, it is ideal for families and couples alike. Coastal Delight has good off street boat parking behind a high fence and a 5 minute drive to the Port Hughes boat ramp. The secure rear yard with outdoor dining area off the kitchen is sure to be a hit in summer. Coastal delight is a 4 bedroom property that can sleep up to 9 guests. With 2 bathrooms (one being an ensuite) with a bath in one of the bathrooms. There is ducted reverse cycle air conditioning throughout. Two lounge areas both with large TV’s, USB ports and DVD players. The spacious lounge/dining/kitchen area overlooking the rear yard and pergola. Well equipped kitchen has gas stove, dishwasher, and coffee machine (BYO Nescafe Dolce Gusto pods). Large hooded BBQ with side burner and fish cleaning sink provided. Pets not permitted. 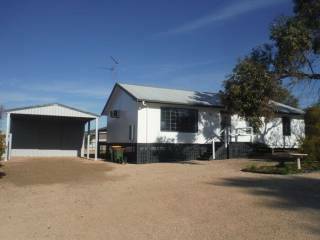 Travel information and prices info are provided and coordinated by the Country Getaways Accommodation Holiday Rental team. Country Getaways (CG) has taken due care and responsibility to verify and check all information is accurate at the time of compilation. Strictly no parties or functions. If either are discovered, Police will be called, you will be asked to leave and there will be no refund of any bond paid, or if no bond has been paid, a charge of $500 will be debited to your card (whichever is the greater). If in doubt, please talk to us for clarification. Guests must inform the Country Getaways office immediately upon arrival of any damage, faults or breakage to the property and its contents by phoning our office. If no contact regarding the condition of the property is made, it is deemed that guests have accepted the property in the condition of arrival; and that any damage/fault will be considered to have occurred during the guest’s stay and charged accordingly. All damages and extra cleaning will be deducted from the refundable security bond or credit card details. Check-in is from 2.00pm, unless an early check-in has been arranged. Refer to item 12 Upon Arrival and contact Country Getaways on if required. These terms and conditions may be negotiable, dependant on the time of year and at our discretion. In some cases, we may be able to hold payment “in trust” for use within a 6 month period for use at the same property. If not used within 6 months, the amount held will be forfeited. All gas (household and barbecue) is included in the rental cost. If gas bottles are empty, refer to the information folder within the property for refill arrangements or contact Country Getaways. If household gas bottles have run out, please switch to the other bottle; or if both bottles are empty contact Country Getaways.